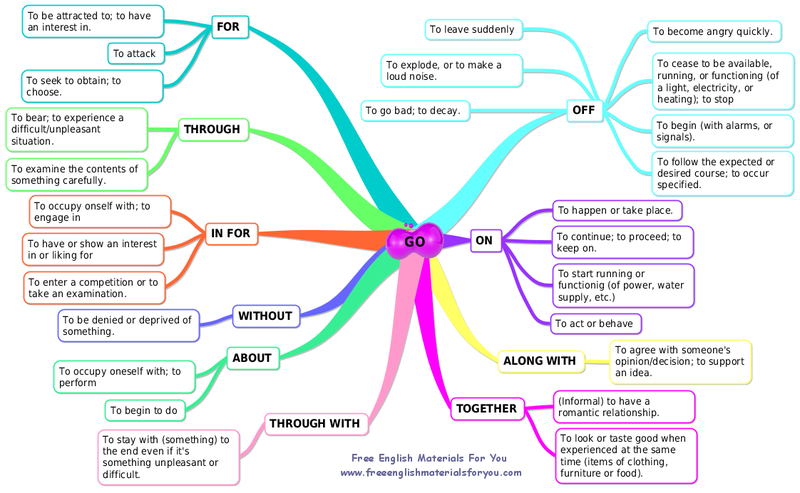 You can download this mind map (imx. file) on Biggerplate. 1) To be attracted to; to have an interest in. – You and me … We go for the bad boys. – He tends to go for girls like her. – The neighbour’s dog went for the postman and bit him. – He is known to go for the jugular in arguments. 3) To seek to obtain; to choose. – I think they would go for that kind of centralization. – I could really go for some hot wings. 1) To bear; to experience a difficult/unpleasant situation. – Nobody would want to go through something like that. – In Malta, my fellow workers are going through disastrous changes. 2) To examine the contents of something carefully. – We need to go through every message and assess the damage. – That subpoena gives us the right to go through your files. – She goes in for volleyball. – We have responded more to the will of our citizens and have been that much less inclined to go in for big events. – This will enable our students to go in for a three-year degree, in Italian, directly from Cairo and also take the exams in Egypt. 2) To have or show an interest in or liking for. – I thought you didn’t go in for those kinds of shenanigans. – I don’t go in for those modern things. 3) To enter a competition or to take an examination. – My brother decided to cheer himself up by going in for a competition. The prize was a luxury holiday in the Caribbean. – He went in for the photography prize but didn’t win. – His school had suggested he go in for the Young Musician of the Year competition. – If you don’t like your tea, you can go without. – She has had to go without a holiday for several years now. – There were days I knew he went without food to buy music paper. – Meanwhile, the unsuspecting citizens of Coruscant go about their daily lives. – The shoemaker goes about his work with a smile. – We went about getting evidence of what was going on. – How can I go about getting a good idea? To stay with (something) to the end even if it’s something unpleasant or difficult. – She went through with the divorce. – We’re going to use him to go through with the transaction. – Now you won’t have to go through with all that mess. 1) To explode, or to make a loud noise. – The bomb could go off at any moment. – The Hulk is a bomb waiting to go off. – John went off with the money. – Brian is going off to Milan and we’re throwing him a farewell party. 3) To become angry quickly. – He went off in a flash when he heard the news. I’ve never seen him so upset. 4) To cease to be available, running, or functioning (of a light, electricity, or heating); to stop. – The generator went off and we can’t get it started again. – The lights go off every six minutes, you know, to save electricity and stuff. 5) To begin (with alarms, or signals). – My alarm clock didn’t go off today and that’s why I was late. – My alarm clock went off at 7:00 a.m.
– It’s programmed to go off before you do. 6) To follow the expected or desired course; to occur specified. – The party went off well. 7) To go bad; to decay. – Something has gone off in the fridge, there’s a horrible smell. – The food went off very quickly, we had to throw it all. 1) To happen or take place. – What’s going on at school? – What’s going on outside? All your friends are out in the street carrying placards. 2) To continue; to proceed; to keep on. – Please, go on. Don’t let me interrupt you. – Go on, tell me what happened next. – The alarm goes on when you close the front door. 4) To act or behave. – Don’t go on like that; stop kicking the dog. To agree with someone’s opinion/decision; to support an idea. – I said it wouldn’t work. I didn’t go along with it from the beginning. – She’s still angry with me for going along with your idea. 1) To have a romantic relationship (informal). – Are Mark and Mary still going together? – They had been going together for years. 2) To look or taste good when experienced at the same time (items of clothing, furniture or food). – Fish and red wine don’t go together. – Drinking and driving don’t go together. I made this quiz for you :-), it will take you no more than 15 minutes. Try it out to check your knowledge about this topic.